We’ve been visiting Jerome off and on for about twenty years now, and we always enjoyed the shops and galleries, museums and quaint restaurants. But we had always stayed on the main streets that switchback through the main part of town. For some reason we had never really explored the little side roads. This time we decided on a whim to venture north of Jerome to look for some good photo ops. We wound up on the road that leads to Gold King Mine Ghost Town. And if you’re into HDR photography, it’s a mother lode of high dynamic range rust, machinery, wood grain, dust, and just generally old stuff. I could have spent the day there, but I was limited to just a couple of hours since we had to get back to the hotel in time for check out. We WILL be going back! HDR created from five bracketed photos processed in Photomatix v4. Post-processing in Topaz Adjust / DeNoise with Paintshop Photo Pro X3. The owner/operator of the site was very gracious and told us that we could go check out of the hotel and come back if we wanted to. She even said we could come back in a few days and continue our visit without having to pay another entry fee. They welcome photographers AND their tripods (imagine that! ), so you don’t have to feel anxious about shooting anything in there. I’ll be posting more photos from our visit to Gold King Mine here on this blog and also on my Flickr page in the set titled “Jerome Arizona – 2011.03.12“. 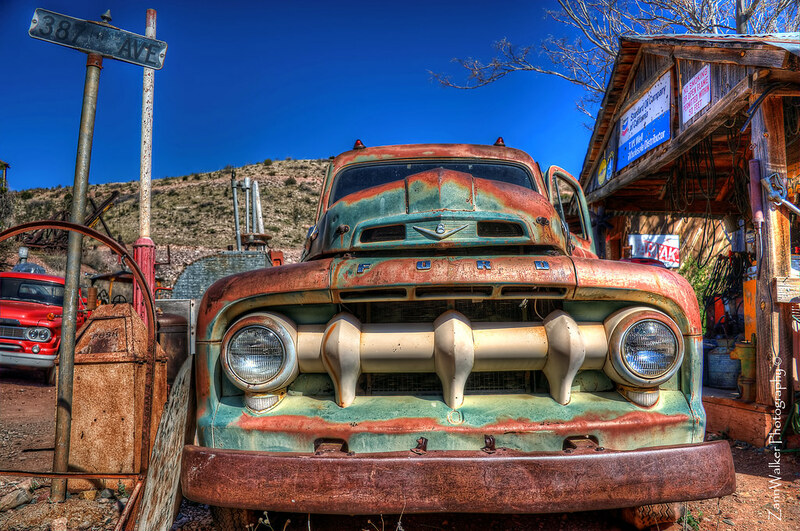 This entry was posted in Information, Shooting and tagged abandoned, antique, Arizona, AZ, camera, D700, Ford, ghost town, Gold King Mine, HDR, Jerome, Nikon, Paint Shop Pro, photography, Photomatix, rust, tripod, truck. Bookmark the permalink.